'Pokemon A' is coming again. Yujin (Tomy Arts) will release Pokemon Sticker Movie 12th version in the middle of April, gashapon (capsule toy), 5 kind of capsules, 5 kind sticker inside. Will replace the photo later. 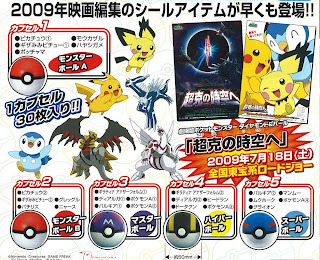 Same as movie 11th last year (before official announce Shaymin sky forme), includes 'Pokemon A'. Not sure this Pokemon A is new Pokemon or Arceus at present, will be cleared by upcoming info. Arceus in Pokemon movie 12 ? It was poor explanation of Eevee Paper Watch, orz, posted additional info. Japanese confectionery and pharmaceutical company Meiji Seika Kaisha, Ltd releases Pokemon Food Knapsack on 27 December 2008, it is available at convenience store Seven-Eleven Japan only. Includes foods, small pouch. World Hobby Fair (WHF) 2009 will be held from 18 January to 8 February at Osaka, Tokyo, Nagoya and Fukuoka sequentially. 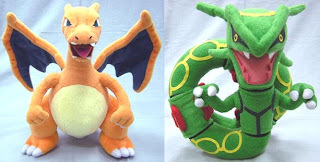 PokemonJP will sell the following plushies. For Diamond, Pearl and Platinum game promotion, PokemonCenter JP distributes Eevee to your DS/DSi from last December to 12 January. Moreover, when you bring evolved Eevee (Vaporeon or Jolteon or Flareon or Espeon or Umbreon or Leafeon or Glaceon) after playing game, the following paper watch will be presented from 17 to 31 January. No plan to sell, promotional product. Material is paper basically, Polypropylene (PP) cording on the paper probably. Like this. Hoping you had good holiday season and new year. Namoco's game center in Japan presents Pokemon stationery set from 20 December 2008 to 12 January 2009. Includes a pencil, pencil case and ruler set.